There is something nostalgic about a train ride. It’s the civilized way to travel the congested Northeast corridor and is relatively inexpensive, effortless and has multiple trains per day traveling between the two cities. Acela Express offers business class and 1st class, it has limited stops and takes a bit over 4 hours. Northeast Regional is a bit cheaper, offers coach as well as business class, has mores stops and takes about 4 ½ to 5 hours. 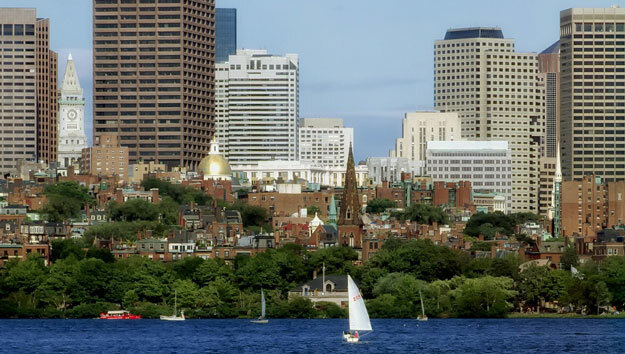 Downtown Boston is the place to experience Boston by land and by sea. Downtown, along Boston Harbor, is where colonial-era historic sites co-exist with contemporary high rises and has good restaurants and an active, trendy vibe. It’s a convenient hub with easy access to the North End for a great Italian lunch or dinner, Back Bay for serious shopping or check out Seaport District for a night on the town. If you arrive on a Friday evening, have a rum drink at Rumba or a vodka martini at Vodkaba in the Intercontinental Hotel on Fort Point Channel. Follow it up with a fresh Provence-influenced dinner at Miel, the hotel’s popular restaurant overlooking the floating Boston Tea Party Ships & Museum. Start out early Saturday with breakfast at one of the many downtown places – on Broad, South, Summer streets; down Congress, on Farnsworth and in Post Office Square – each offering their specialty: tasty breakfast sandwiches, huevos rancheros, pastry treats, even lobster scrambled eggs or omelettes. Spend the rest of the day getting a great overview of the city on a narrated tour on the Old Town Trolley which encourages exploring around its many hop off/hop on stops. Browse the North End’s eclectic shops, markets, bakeries and restaurants in old brick buildings leaning in over narrow cobblestone streets. Visit the Paul Revere House and Old North Church. Allow a half hour each. Follow the Freedom Trail’s red line as it zigzags through historic downtown where several colonial sites are within a few blocks of each other. Step around the Boston Massacre Site Marker. Have a look inside the Old State House, the seat of British control in colonial Boston and the Old South Meeting House, where patriots and loyalists debated. Look for names of colonial era leaders on grave markers in King’s Chapel Burying Grounds. Stop by Omni Parker House Hotel on School Street for a piece of real Boston cream pie. Enjoy a mug of beer and pub fare in the friendly atmosphere of Cheers of 1980s sitcom fame. Walk over to serene, willow-draped Public Gardens. Take 15 minutes for a Swan Boat ride. Walk along the crisscrossing paths in Boston Common. Spend the afternoon walking through Copley Square. Have a look inside imposing Richardsonian Romanesque Trinity Church. Stroll and shop along nearby picturesque Newbury Street lined with an interesting mix of upscale shops, boutiques, galleries, bookshops, cafes and restaurants on the ground floor of charming brownstones. Have dinner in trendy Seaport District where seafood reigns on all three floors of Legal Harborside, Italian specialties at Strega, steaks at Morton’s. Or, in smaller space off the water check out Legal Test Kitchen for delicious new creations; Table 34, where oysters come with pedigrees; Sam’s, if you can find it! Depending on whether art or nature is your thing, spend Sunday doing one of two wonderful Boston experiences. Nature lovers, from the end of March through November spend 3 invigorating hours in search of magnificent migrating whales on New England Aquarium’s Whale Watching Tour. Follow that experience with a lively tour of the Boston Tea Party Ships & Museum which ends in Abigail’s Tea Room, where beverages stronger than tea are also served. Art lovers, spend as long as you can browsing gallery after gallery of world-class art from ancient to contemporary in the Museum of Fine Arts. Enjoy lunch in the huge atrium centered by a remarkable Chihuly glass tree. Ride Amtrak for the 226 miles between NYC and Washington D.C. It’s a fast, comfortable, quiet 2 hours and 45 minute ride between Penn Station and Union Station. Compare that to 4 ½ stress-filled hours on the NJ Turnpike and I-95. 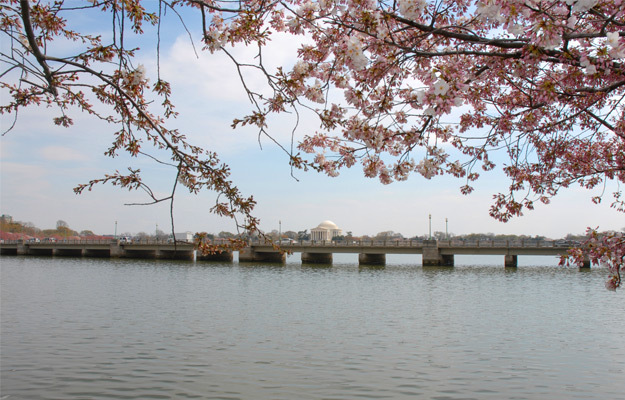 Stay as in a hotel close to the National Mall. If you arrive Friday late afternoon, D.C. buzzes at Happy Hour. Have an inside-the-Beltway experience in a crowded place around Capitol Hill or join the trendy set at the busy, casual bar and lounge at The Source in the Newseum. Enjoy dinner at one of the many fine restaurants around fashionable Dupont Circle. Spend Day 1 on the East Mall of the National Mall encompassing the U.S. Capitol, rising on a hill on the east end; world renown museums, galleries and gardens along each side; and the Washington Monument, the imposing anchor of the west end. Pick 2, 3 at most, Smithsonian museums you want to see until mid-afternoon. They are free, amazing and totally overwhelming. All have cafes for a welcome lunch break. Travel through the history of flight in National Air & Space Museum; journey through everyday American life and ingenuity in National American History Museum; see splendidly diverse Natural History Museum; enjoy contemporary art inside and out in Hirshhorn Museum and Sculpture Garden. Walk over to The White House South Façade, just north of the Ellipse and the Washington Monument. Looking beyond the fence to the back view of the iconic house, the columned, curving South Portico beyond the famous South Lawn is a timeless photo op. Time for Happy Hour again! Find a rooftop bar and lounge with a view. Pricey, but the view is well worth it. Check these out: Rooftop/Embassy Row Hotel and Ozi near Dupont Circle; on 14thSt. NW, ADC atop Donovan House and Marvin; Local 16 on U St.; posh A-list hangout, POV, atop the W Hotel. Relax, have a drink, some bar snacks or small plates before viewing the nation’s majestic Monuments glowing in white light on a Monument by Moonlight Tour. Departing at 7:30pm from Union Station, the 2.5 hour tour is hands down the best way to see these stirring monuments. See amazing details up close at 3 stops – MLK Jr Memorial and FDR Memorial; the Lincoln Memorial with the Vietnam Veterans Memorial and Korean War Memorial nearby; and the iconic Iwo Jima Memorial. Start out Day 2 with a fabulous brunch in the Capitol Hill neighborhood – Belgian waffles at Belga Café; totally French menu at Bistro Cacao or Montmartre; peanut butter and bacon pop tarts at Ted’s Bulletin; Cava fries with anything at Cava Mezza; a sunrise burger at Granville Moore’s; DC’s best pancakes at Lavagna. Spend a couple of hours at popular Newseum, a dynamic, engaging, interactive place. Seven levels, 15 theaters and 15 galleries packed with exhibits explore journalism past and present through the five freedoms of the First Amendment: religion, speech, press, assembly and petition. Go on a walking and tasting tour of Georgetown, Washington D.C.’s most fashionable and historic district on Georgetown Gastronomic Food Tour. From 3:00 to 6:30 pm take in Georgetown’s charming quaintness, cobblestone streets lined with historic townhomes, wonderful shops and culinary hotspots while enjoying wonderful pre-selected meals and traditional tastings. Historic Philadelphia, 95 miles from NYC, is the place where events pivotal to the birth of America took place. Driving just under 2 hours to get there seems like a natural, until you consider city traffic, tolls, gas and parking. Amtrak is effortless on a 1 ½ hour ride to Philly’s 30th Street Station. Stay in a Historic District, Old City or Society Hill where history, shops, galleries, bars, and restaurants are within walking distance. Get your bearings at Independence Visitor Center in Independence Mall, a 4-block area that was the center of the community in mid to late 1700s. This is where you’ll find museums, historic halls, churches, and ancient burying grounds. Take a timed tour of Independence Hall (free tickets at the Visitor Center) where, in just two rooms, the Declaration of Independence and the Constitution was drafted. No tickets are necessary to view the nearby Liberty Bell, the iconic universal symbol for those seeking their rights. In the National Constitution Center experience how the U.S. Constitution, one of the most important and influential documents in history, influences the cultural and daily lives of Americans today. Stop to see how coins are made in the first and still active US Mint. 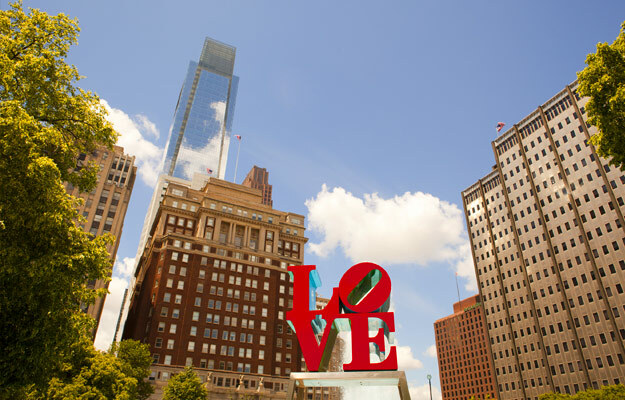 Follow up these highlight visits with an hour Carriage Tour of the Historic District, around Independence Mall, through Old City and Society Hill. Have lunch at a busy, bustling, crowded indoor Reading Terminal Market, the oldest continuously operating farmer’s market in America. Dizzying with color, action, and scrumptious aromas, lunch choices are global. Spend the rest of the afternoon in the Philadelphia Museum of Art. Before entering, there is a tradition to be followed! Walk up the “Rocky” Steps leading up to the Museum’s east entrance, made famous by Sylvester Stallone in “Rocky III.” Before the climb, take a selfie with the statue of Rocky Balboa at the base of the stairs. Once inside, walking through spacious, beautifully curated exhibitions covering art forms across all cultures and continents is wonderful. Philly has lots of restaurants choices – Italian, French, Asian, Mediterranean, Latin, Southern and Soul, Steak, Vegan. Tapas restaurants, serving small plate deliciousness, are big – in Old City try Amada, the grandest of them all; near Rittenhouse Square, Tinto serves tasty Basque cuisine; Jet Wine Bar on South Street West has wine from around the globe. Try these too: in Old City, Barra has yummy brick oven pizzas and Italian beer; Continental Restaurant & Martini Bar is a hot spot. Vetri in Center City is one of the best Italian restaurants in the nation, if you can get a table! Of course, there are plenty of places serving Philly’s famous cheesesteaks! Start Day 2 with a walk through colorful Chinatown. The mix of unique architecture, eclectic shops filled with all manner of Asian goods and souvenirs, markets, noodle houses, bakeries and restaurants too numerous to count – Chinese, Vietnamese, Thai, Korean, Malaysian – make it a fun place. Head over to Penn’s Landing at 11:30 for a 2-hour lunch with great riverfront views on a Spirit of Philly Lunch Cruise. Back on land, experience the vibe up and down South Street, Philly’s eclectic, bustling “happening” place. People from all backgrounds, ages and cultures live and gather to enjoy its thriving music scene, innovative art in galleries and on café walls, clothing boutiques, vintage stores, bookstores, record stores, and ethnic restaurants. Don’t miss Magic Gardens, a mosaic maze of outdoor folk art installations of found objects, colorful glass, thousands of glittery mirrors. 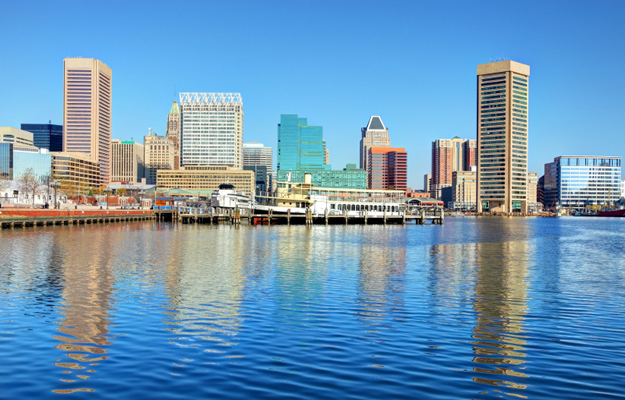 Stretching along Chesapeake Bay, Baltimore is all about the waterfront – seaport, sealife and seafood. To travel 192 miles between the two cities, it takes 3 hours+ via the NJ Turnpike and I-95S, or 2 hours and change on Amdrak, Penn Station to Penn Station. Baltimore is a place for history buffs, art enthusiasts, foodies, and anyone who enjoys activities on and around the water. Stay in Inner Harbor, a destination unto itself. Spend a full day there, on historic ships and harbor tours, visiting museums, dining on fresh seafood in restaurants, shopping, getting into the nightlife. All are a walk or water taxi ride away. Get out on the harbor on a go-fast Seadog tour, combining history, views and fun. Or, relax in climate-controlled comfort on a 50 minute sightseeing cruise on the Spirit of Baltimore. Water taxi out to Fort McHenry National Monument, tour Historic Ships, including the USS Constellation, the last all-sail ship in the U.S. Navy, and the Lightship Chesapeake. Step inside spectacular National Aquarium for a trip through an Amazon River forest and a coral reef. See sharks, dolphin and jelly-fish; discover unusual creatures of Australia; spot the camouflaged ones in Rainforest; experience natural beauty of Maryland from mountain to stream to tidal marches, beaches and ocean. For nighttime fun –bars, dining and live music and comedy clubs – the place to go is Power Plant Live! a block away from Inner Harbor. Or along Inner Harbor try any one of the seafood restaurants with water views. Venture out of the Inner Harbor on the free Charm City Circulator’s Purple Route to Boston Museum of Art, a wonderful place for art lovers as well as foodies. The Museum, located on the campus of Johns Hopkins University, has a fabulous collection of 19th Century, Modern and Contemporary art. Combine this special experience with a scrumptious regional farm to table Brunch in Gertrude’s Restaurant, a sophisticated, beautiful space inside the Museum, with some outdoor tables overlooking the Sculpture Garden. Spend the afternoon in a totally different Baltimore place – Fell’s Point. A historic waterfront community just east of Inner Harbor, easily reachable by water tax, is small, quaint with a wonderful ambience and a comfortable vibe. Century-old row houses, cobblestone and red brick streets, outdoor seating at wonderful small ethnic restaurants serving German, Czech, Polish, Mexican specialties,, lots of bars, antique shops, eclectic shops is a fun place to stroll, browse and stop. The thunderous wonder of Niagara Falls is mesmerizing. The combination of height and volume is what makes Niagara Falls so astounding. On the America side, more than 6 million cubic ft of water goes over the 850 ft. wide crest every minute, plunging 188 ft. into the river. Seeing and feeling the sheer power and never-ending roar of this magnificent natural phenomenon is an experience of a lifetime. Regardless of how you travel, getting there from NYC takes a long time. The quickest way to make the 408 mile trip for a weekend getaway is by plane. Flights into Buffalo, NY, only 17 miles away from Niagara Falls, take about an hour. Rent a car in Buffalo to get around. The 9 ½ hour Amtrak ride and the 7 ½ hour car drive, longer if tangled in traffic, are scenic but call for at stretched out weekend. Given the lengthy travel time, make the most of a Niagara weekend by focusing on the falls, Niagara Falls State Park surrounding them, and Niagara Falls downtown district. Stay in brand name hotels around Niagara Falls, along scenic River Gorge or in one of the pleasant B&Bs in the area. For a night life of gaming, dining and entertainment, Seneca Niagara Resort & Casino is an option. Experience several thrilling ways to see the American side of Niagara Falls. No two are alike. Begin in Niagara Falls State Park, where you can get around on the vintage-style Niagara Falls Scenic Trolley. The guided tour offers history, tips on the park’s top attractions and hop off/hop on opportunities along the route. 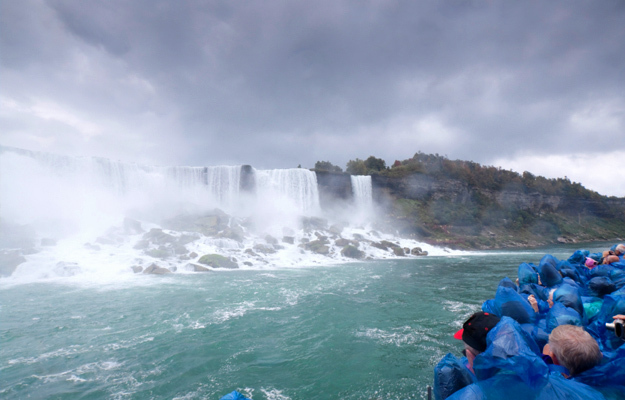 Prepare to get wet on a Maid of the Mist Tour to the base of the falls (poncho provided!). The mist? Let’s just say it’s more like rainfall! See calmer and more private Bridal Veil Falls next to Luna Island. While there, go on a thrilling walk on a Cave of the Winds Tour along a wooden walkway (in poncho and special sandals) from Niagara Gorge to Hurricane Deck, right near Niagara Falls. Take a tour of Goat Island, located between the American and Canadian Falls. Views of both falls and more around this spectacular natural preserve where the spray from the falls creates a natural nursery for indigenous trees and shrubs are truly spectacular. See it all – the falls, islands, Whirlpool Rapids and vistas of both sides of the border on a breathtaking Niagara Falls Helicopter Tour. Not comfortable adventuring around the falls on your own? See it on Grayline’s comprehensive 4-hour Maid in America Tour. Highlights include a Maid of the Mist Gorge Cruise and Cave of the Winds, Horseshoe Falls, American and Bridal Veil Falls, Luna Island, Terrapin Pointe and Prospect Point, Whirlpool State Park. For a change of pace, stop by museums and studio spaces for resident artists. Castellani Art Museum has collection of contemporary and 20th century art and interesting folk art. See soap stone carvings and paintings of internationally known Iroquois artists in the Native American Art Musueum. Stop by 24 Below Art Gallery & Café for unique artisan gifts, art gallery, workshop and café; check out Art 247 and Art Park overlooking Niagara River Gorge.